In order to be receptive to the energy from any crystal we must have the capacity to receive it! Fortify your pelvic floor with a heavy stone such as Jade (the heaviest of Yoni Eggs). 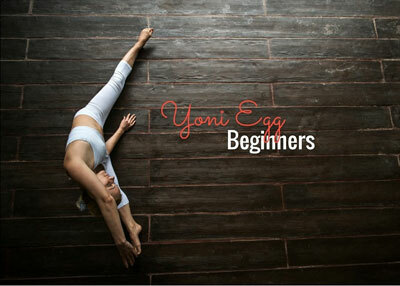 Strength is essential for all Yoni Egg beginners, although it may not be primary for you. When we have strong muscles we have more innervation in our vaginal muscles, more stimulated nerve endings (which receive the energetic sensations), more capacity to move our muscles, and thus more promotion of sensual feelings in our Yoni. Also, pick out a medium or large, as the smaller Yoni Eggs are best for coordination practice after we have built a strong pelvic floor foundation. All Yoni Eggs beginners start out not knowing exactly how to manipulate their vaginal muscles in order to control their egg. For example, beginners realize that the moment they squat over the toilet, their Yoni Egg is quickly falling out! If they are not keen enough to this subtle sensation they may drop their egg in the toilet…a very popular phenomenon with all beginners. Other scenarios include sneezing hard, laughing hard, or simply getting lubricated and the egg slipping out. If you have chosen a more fragile stone, such as Clear Quartz, Rose Quartz, Amethyst, Citrine, etc; then you run the risk of having the stone crack. Again, Jade is best for beginners because it is as tough as a diamond and will never crack. Thousands of Yoni Eggs beginners have reported that they desire to build their sexual energy for the spiritual fortification it provides. There is great significance in Jade being the historical Yoni Egg for thousands of years. Jade builds kidney strength and our kidneys generate our sexual potency (known as our Jing in Chinese medicine). Because Jade is also a very grounding stone, it allows newly released sexual energy to both soar, yet be stabilized by the denseness of the stone. Thus, Jade is the best energetic stone to use for promoting our orgasmic health and well being.